Today’s the day to go bananas! Peel back some silly picture books! This is a one word picture book sure to delight toddlers and preschoolers. Banana! is shouted from off-page as one banana after another is lobbed at unsuspecting jungle animals. Together they all throw their bananas back at the same time, landing all around the monkey. Banana! 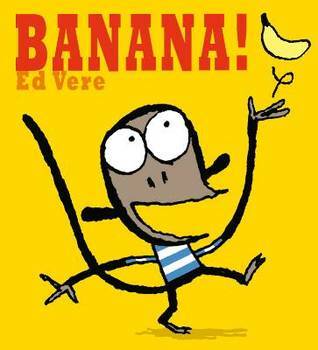 This two word picture book involves the relationship between two monkeys and one banana. Read with expression and watch the story unfold as one monkey repeats one word…’banana’ … in joyful exclamation, asks pleadingly, grabs, insists, and has a tantrum, before he finally asks ‘Please?’. In the end there are two words, two monkeys, and half a banana each.